NEWPORT, RHODE ISLAND (USA) - The classic design and quality craftsmanship of a Trumpy ® Yacht is now available in three models of Trumpy Tenders. 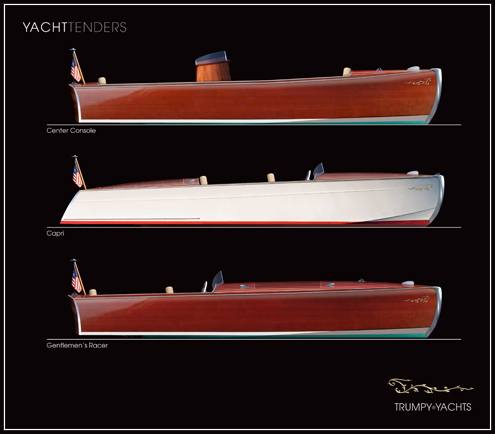 Trumpy, in collaboration with YNOT Yachts has created the Gentleman's Racer, The Center Console and the Capri. The 20' Tenders, offered as standard equipment on new Trumpys over 100 feet, are now available to all. "From leather upholstery to custom hardware, the Trumpy Tender is everything a Trumpy is famous for - great lines, wonderful craftsmanship and state of the art cold molded materials featuring the West System," said Johan Trumpy. For more information about the new Trumpy Tenders, visit www.trumpyyachts.net.